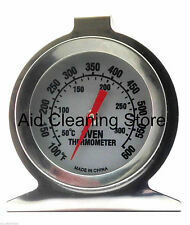 Chef Aid Oven Thermometer . Stainless Steel|Hangs or Stands|Clear display|Centigrade or Fahrenheit|From the Range of Baking and Icing Goods from Chef Aid . Shap and sensitive probe. - Long stainless steel sensor probe. - Protective plastic Bar. - Battery: 1x 1.5V LR44 Cell Battery (Also included). - Working temperature range for the body 0°C ~ 50°C（32°F~122°F）. Frost alarm Temperature range: -4 F to 140 F(-20 C to 60 C). Switch: off/ on. Batteries: contains one CR2032 battery. 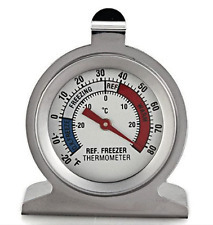 Ideal for Fridge and Freezer use Rotating dial allows Thermometer to stand or hang Displays temperature in Fahrenheit and Celsius operates between minus 20 degrees to plus 80 degrees Fahrenheit and Minus 30 to plus 30 Degrees Celsius From the range of products from Tala . Digital LCD display, high accuracy and stability. Size: 4.8 x 2.8 x1.3cm(approx). Power: Two LR44 button battery-powered Included. 3,The probe is waterproof, but the Black Connector part is not waterproof. 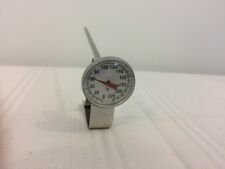 Probe 2 for OVEN temperature testing ( Probe and Wire can withstand up to 716°F (300°C) and IPX7 water-proof standard). Main Functions: Food and Oven temperature of the wireless transmission functions ( The signal transmission range up to 230ft). 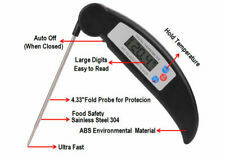 Chef Aid Instant Read Thermometer . Mark in Celsius|Instant Read|Ideal for Meat|Easy to Use|From the Chef Aid range of products . 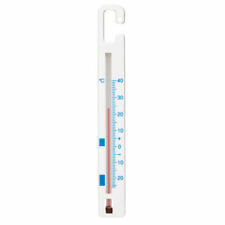 Brannan Quick Set Push Button Maximum Minimum Thermometer . Wall moumted max-min thermometer|Retains both highest and lowest readings|Easily resetable via push-button|No separate magnet needed|Temperature range of -30Ã‚Â°C to 50Ã‚Â°C . Temperature Accuracy: /-0.1F/C. High accuracy 1%RH and ±1°F/°C, and a wide temperature range from -58°F to 158°F (-50°C ~ 70°C). Humidity Accuracy: /-2% from 30% to 80%. Temperature Range: -50C ~ 70C. I did a bit of research and bought one to try. Went ahead and got a large order and will be carrying it at Morezmore from now on. If you receive our invoice but not ready to check out, consider it a running tally. Dual Probe . Safe food ABS plastic case and stainless steel probe. With backlight, double channel temperature display. The transmitter also has a temperature display function (no receiver can be used in close range use). Small size with 50W high power handling. Aluminum shell resistor (golden aluminum shell) series, the shell is made of aluminum alloy. 1 Ohm resistance. Strong overload capacity with high weather resistance. • Stainless steel food probe with high quality cord. • Alarm sounds when food reaches preset temperature. Key features. Stainless steel probe with 1m (39’’) heat resistant wire. - Material: ABS Stainless Steel Probe. - Wire length:1 m/39.37’’, probe length: 21cm/8.27’’. - Displays preset and actual cooking temperature. Temperature display resolution: 0.1. Colour: white. °C / °F Key : the display mode,this button can be °C / °F conversion function. We stand behind our products. We will work with you to resolve any issues you may have. Power By : AAA batteries (NOT INCLUDED). Quantity: 1PC. The alarm sounds when the food reaches the set internal temperature. Stainless steel food probe with braided rope. Main material: stainless steel. Stainless steel panel. The preset temperature can be changed manually. It may be send randomly. Wireless transmission function of food and cooking temperature. Wireless Digital . 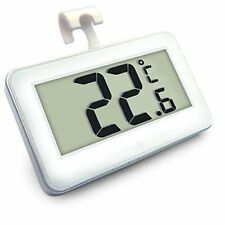 °C/°F temperature display options, backlight function. Due to the difference between different monitors, the picture may not reflect the actual color of the item. Temperature range: -50°C ~ 70°C. 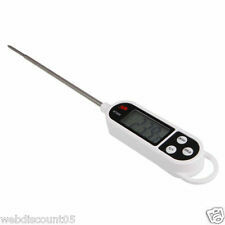 Usage temperature: -10°C ~ 50°C. Distinguishing temperature: 0.1°C. Cable length: 76cm (30"). 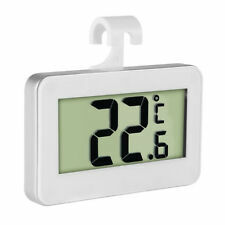 Automatically displays temperature & Indoor humidity. Build in probe for feeling the indoor temperature. Humidity range: 20% ~ 90% RH. Temperature unit: °C or °F. Temperature range: -10℃ ～ 50℃ ( 4℉ ～ 120℉).